A haredi man shut down traffic in the heart of Bnei Brak to protest bus driver allegedly barring him - but allowing Arab passenger on board. Traffic was shut down in the heart of Bnei Brak for nearly an hour on Tuesday when an elderly haredi man launched a solitary protest, blocking a passenger bus from continuing on its route after claims that the Arab driver discriminated against him. 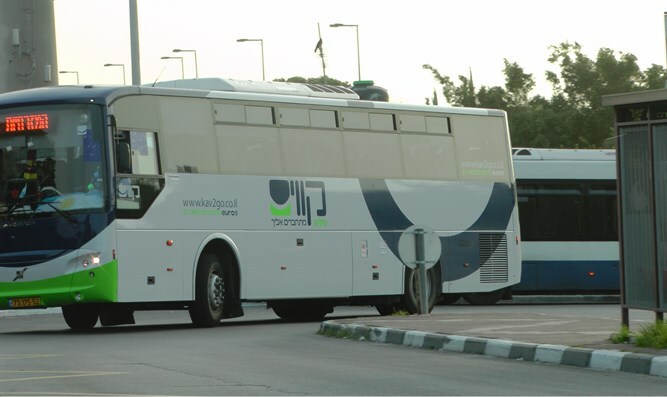 The incident occurred Tuesday afternoon on Rabbi Akiva Street in Bnei Brak, when an elderly haredi man claims that a 230 line bus from the Kavim bus company on its way to Modiin Illit stopped to pick up an Arab man. According to the protester, the driver let the Arab man on board there, but refused to take on the haredi man. At that point he decided to protest what he called an act of racism, standing in front of the bus and refusing to budge, quickly backing up traffic on the busy street for miles. When police arrived, the man was found lying on the ground in front of the bus, holding his head, though the driver and witnesses say the bus did not hit the man. “After about a kilometer, the elderly haredi man sat down on the road and didn’t let the bus move forward at all while yelling ‘There will be no racism here. You cannot let an Arab board but block a Jew’. Eventually police responders removed the man from the street, allowing the bus to move forward and the congestion to dissipate.